Welcome to Nature Relax! Our entire line of home textiles and bedding is Natural, Healthy and Luxurious. We design and manufacture our products to meet the highest standards of the bedding industry. Creating ecstatically beautiful products and meeting high luxury standards at affordable price to our clients. High quality construction, elegantly stitched, this Ultra Soft Aloe Vera Infused Reversible Microplush Throw / Blanket is extremely warm and cuddly soft. It is practical comforting and ultra soft to cuddle on a cold winter night with a cup of coco and a movie or your best seller novel. You can enjoy it throughout the night on your bed for added warmth by your feet or drape on grandma’s rocking chair. Suitable for a child’s room, in a dorm, on your boat or RV, or as a picnic blanket! This superb Ultra Soft Aloe Vera Infused Reversible Microplush Throw / Blanket makes a great gift for, almost, everyone on your list for the Holidays, Birthdays, or a special treat for yourself! It measures oversized 80″x50″ inches, a perfect size to carry around from room to room on a cold day. 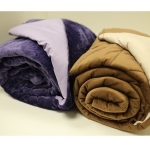 It’s also a great alternative to airline blankets, and it packs easily and light weight.